If you have any questions regarding availability, color, size of print, fractions of yard, or any other concerns, please call us at 907-895-5210, or email us at info@thecalicocow.com and we will be glad to answer your questions and/or take your order over the phone. Thanks for shopping with us! This site is being built. Come back soon! These collections are coordinated to compliment each other. While planning a new quilt it's nice to see fabrics that will go together next to each other. Please remeber colors may vary slightly, as each computer has it's own settings. Unique applique designed and created by Mary Stenros. Each pattern has a detailed art inspired silhouette of nature and mostly Alaska themes. Most patterns require two differnt fabrics, backeground and silhouette. fabric requirements and deminsions are listed. Warm and cozy quilts ready for use. Each quilt is hand made and has an extra dose of love. All quilts are 100% cotton, and made with the finest fabric. These are unique and would make a great gift to that special "someone". Fun wall hanging project for all skills of quilters, from the beginer to the most experienced. 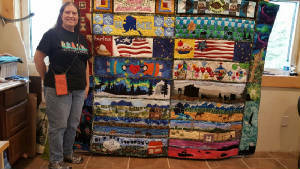 Each quilt is unique and fun using bright colors and whimsical designs.